Over the weekend my colleagues and I pulled a plane for Special Olympics! We did not come in first but we were not last either so... hooray us! I will save you the photos of our pull and share with you some pics from the kid's plane pull that my son participated in. The kids were divided by age and then into teams. No idea if they actually timed them but the kids had a blast. They had so many fun things for the kids to do while their parents pulled the plane it would be worth going to next year even if I don't pull a plane... best part - free! 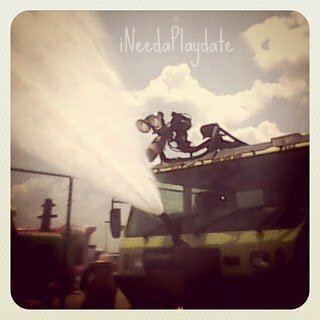 Bounce houses, Euclid Beach rocket ship and the fire truck spraying water were all a big hit. It was a great day for the kids as well as for the adults and all for Special Olympics. Check out the video at the end of this post to see a montage of the teams pulling the plane from our local TV station.